At Eurofrits we have the widest range of frozen products of the variety Fowl Specialities. 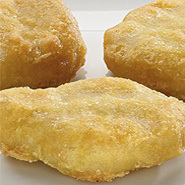 Product made of chicken breast coated and pre-fried. Product made from chicken meat coated with crunchy breadcrumbs.